Anita had a lot in common with Elvis. Like Elvis had moved to Memphis as a teenager from a rural area of Tennessee where she was born. The first meeting of Elvis and Annie (as he sometimes liked to call her) was set up by a mutual friend as a blind date. 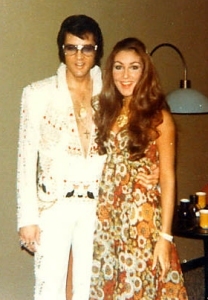 Elvis and Anita spent a lot of time together in Memphis before his career took off. They would usually spend their dates at the movies, the skating rink or a place they both loved, Libertyland. While dating Elvis, Anita also got to know Mrs. Presley very well. The two got on famously, probably because of their similar background. 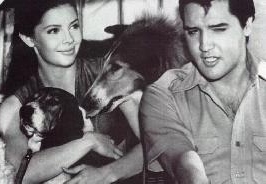 Anita would recall that Mrs. Presley half expected her and Elvis to marry because they were so close and that she just couldn’t wait to see their little children walking up the driveway. As the film career kicked in they didnt see too much of each other and thats where the movie magazine started to report Elvis affairs with his leading ladies. As 1958 came so did the army and Germany. Anita and Elvis exchanged Love letters at the time but it was here where their they parted and a new name suddenly entered the headlines Priscilla Beaulieu. When Elvis returned from Germany little was mentioned of Priscilla so it was presumed that she was just another name for his little black book. One thing which Elvis did say about Priscilla was the when he first saw her he nearly fell off his chair because she looked so much like, Love Me Tender co-star, Debra Paget. If you look back you can immediately see the resemblance. In the 60’s Elvis raced through a constant stream of female co-stars. There was Nancy Sinatra, then 19, who presented him with a gift from her father to commemorate their “Timex TV Special” Elvis first TV appearance since he left the army. Nancy and Elvis known each other before and as was the custom columnists presumed any friendship that went beyond three dates meant the couple were engaged. All indications by the press were soon quashed by Nancy, who spooked them by announcing her engagement to singer, Tommy Sands. The pattern was familiar with all Hollywood’s co-star figuring briefly in his life. Of all the leading ladies Ann-Margret stood out from the rest. An obvious choice for the perfect leading lady according to Elvis fans. They had a lot in common, Ann-Margret like to ride motorbikes and they often go riding on their Harley Davidson. They were relaxed in each other company and a certain charisma between them. Even after Viva Las Vegas they kept in touch.